Well pleased both warm and dry. Do exactly what they say they do. After testing these for a short while, these gloves seem to be a good all rounder. Wearing in the scorching heat might not be too good, but for a normal English summer, these are perfectly breathable. Haven't tested in torrential rain yet, but from the few spells that I have worn these, my hands came out bone dry. In terms of comfort and fit, it was perfect. My palms fit great to the size they should, and my fingers followed in suit and fit perfectly. Totally recommend these to any one. 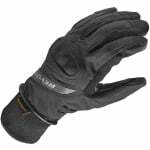 Great gloves, they are very durable I use them every day. In terms of warmth, they are pretty good. Your hands will still get cold if you are riding around 5 degrees outside, but are pretty light weight. Sometimes I use them while cycling, hands don't get sweaty. A really nice look, great feel and comfortable. However, they're meant to be insulated, you know, keeping your hands warm. This they don't do. Well, they don't do it at 70mph. After 1hr on the motorway on Dec 4th 2016 I couldn't feel my fingers, not the tips, but the whole fingers. It's a real shame, I've no doubt they stop water getting in, but they're not intended to be used at speeds. The give away to this is that on the label it clearly shows "scooter" use in their iconography. It would benefit for this product being updated by Sportsbikeshop to show that it's intended to be used in this fashion and save us long distance riders from unfortunate finger agony. I have been caught in heavy downpours and these gloves have kept me warm and dry. The look good and feel good. At first the gloves were tight to out on and off however after a couple uses these gloves started to loosen up and fit my hand a lot better making them really comfortable. The Short knitted cuff is very comfortable and creates a good link between glove and jacket keeping my wrist warm and dry. Although this may not be a Summer glove, I have been using it during the Summer and it is still very comfortable. I have not used this in the Winter months yet so cannot determine how they hold up under very cold conditions. Great product though so far, would definitely recommend. Great service from Sportsbikeshop too, will shop here again. Bought these for the rainy months, they are really comfy and fit perfect true to size, I've been in constant rain for half an hour and my hands stayed bone dry, also surprisingly really warm which is an added bonus.